Price is $3800 flat rate per month. All inclusive. 5 minute drive to get there. This means we can keep doing Mary’s usual routines like her hair appt. on Friday. Newer TV. Not that it matters, Mary doesn’t watch any TV. Bottom line is we don’t really know how Mary would take to doing the move. We will probably break the news to her in the next day or so. Then take her for a tour. The proximity to our place issue is huge. Price is also a big plus. We can pay for it quite easily. We won’t go broke moving her. Cheaper and nicer. That’s a good combination. Today I was with my family eating breakfast after church at one of our favorite places called the “Pacific Diner” in San Pedro. By now, all of the wait staff generally know that I will be ordering Bacon and Eggs. So several months ago, I was sitting next to my grandson Jonathan. So, he asked me what was on my plate, pointing at the bacon. That’s bacon, I tell him. Would you like a taste? Yes, he says. From that day forward, Mike would have to order a side of bacon for the kids. So fast forward to today. Jonathan has an omelet of some kind with bacon. So I tell him how men eat bacon. You don’t eat it with a fork and knife. You can pick it up with your fingers if you like but that is not ideal. I show him how to pick up a half slice of toast, add some jelly and put the bacon on the toast and then fold in half. Tastes great. So Paula asks me why men always eat bacon on toast like that. I tell her that’s because it’s the right way to eat bacon. Gotta teach young lads early. I’m just beginning to unwind from our whirl wind trip to Massachusetts. We visited many friends and family over a six day trip. Weather was very nice. We had a great trip. I even saw a thunder and lightning storm. Luckily I didn’t have to go out and drive in the storm. Don’t see that very much out west here. Many of our friends said to us “Welcome Home”. But here’s the thing. I have spent most of my life living in Mass., including 36 years in Billerica. We have been living in San Pedro now for almost 5 years. Mass. doesn’t feel like home anymore. San Pedro is our home now and it feels like home to me. Will we ever move back? Don’t know. Probably not. I don’t like moving. We’ll be back again next May. In the past, Tuesday nights were family nights. We would have our son and his family over for dinner. But now that the school year has started, doing dinner on Tuesday night became a problem. They needed to get our grandson Jonathan to bed by a decent hour so that he would get a full night’s sleep. School starts at 8:30 AM. and that meant we couldn’t do Tuesday dinner and get done early enough so that Jonathan could be in bed by 7:00 PM. So, Paula and I suddenly had a free night. So I could go to my Shrine Club meeting with the guys. And Paula could go have dinner with the ladies. My meeting was with the Beach Cities Shrine Club at the Whale and Ale in San Pedro. The ladies were meeting at Trani’s, also in San Pedro. So, if Mary was going to eat, she had to go with Paula. I heard from Paula that the service was none to good at Trani’s. We were getting text messages from some of the ladies that they hadn’t been served by 8:00 PM. By that time we were pretty much done. So I had Fish and Chips at the Whale and Ale. This is one of their signature dishes. Very tasty. I had a “Dirty Martini” to wash it down. I need to do a blog post on various martini variations. So to make it short, a “Dirty Martini” is two parts gin, one part dry vermouth and an ounce of olive juice. I think I prefer a Martini straight up. So I was home well before Paula hit the road. I used my “Find My iPhone” app to show me when Paula was coming home. So I asked her how things went. Terrible she says. She asked her mother if she had a good time. Mary says, “No, it was terrible”. Apparently, Mary didn’t recognize anyone at the table except Paula. Even though she should have recognized at least half of the ladies at the table. This event made it clear to us that Mary’s dementia is getting much worse. We will most likely not take her to events like this in the future. No fun for us and no fun for Mary. In addition, she is having more and more difficulty in carrying on a conversation. Well, it occurred to me that our friends back east might be wondering whether we were affected by the current wild fires in Southern California. The current fire that is called the “Sand Fire” is big in the news out here. I am not always quite sure how the locals come up with a name for a fire. But they’re fighting the fire, they can name it whatever they want. The local hour long news this evening spent about 45 minutes covering the fire. Then the national news led the program with news about fire in Southern California. Okay, Los Angeles is a huge area. LA County is about as big as Rhode Island. So here’s a map of Greater Los Angeles. We live down near Long Beach which is mostly an urban area. Not much chance of wild fire. The current fire (called the “Sand Fire”) is up near Santa Clarita. 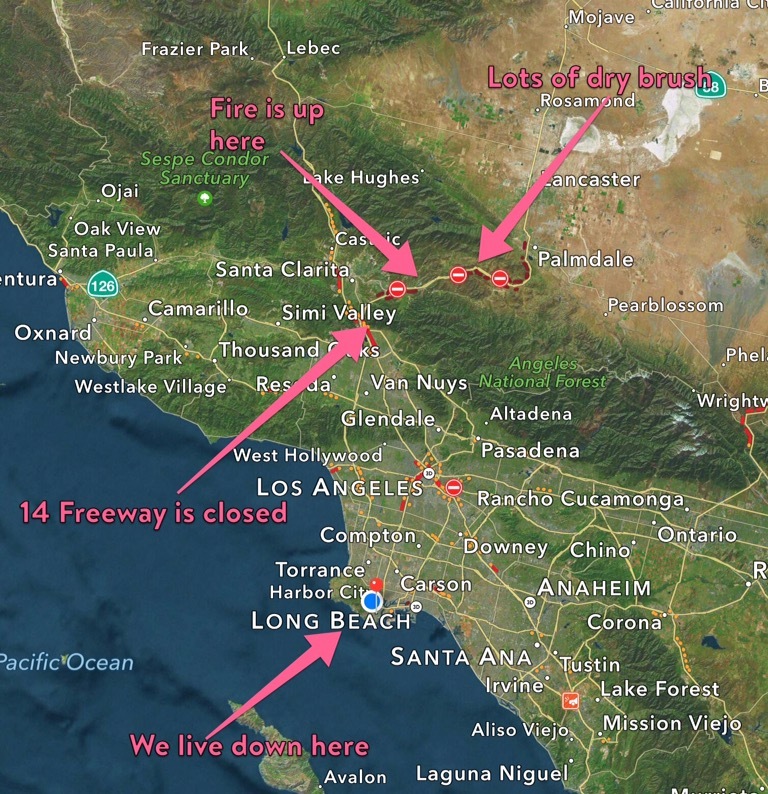 The 14 freeway that runs from Simi Valley to Palmdale has been shut down due to the fire. Many people have been evacuated due to the fire. There is certainly a risk to owning a home up near the mountains especially now due to the drought. Risk is much less for us down south in an urban setting. A lot of the people that live up there own wild stock, horses and the like. So, evacuating is not easy.